Candidates looking for AFCAT 1 2019 - Air force Commissioned Officer posts have a good news as Indian Air Force (IAF) has released notification for the recruitment of Commissioned Officer vacancies in Flying, Technical and Ground Duty Branches through Air Force Common Admission Test - AFCAT 1 2019. Eligible Male and Female candidates may apply online on or before January 2019. For further details like age limit, educational qualification, selection process, how to apply, Afcat syllabus can read the full notification. Indian Air Force conducts Air Force Common Admission Test (AFCAT) twice a year for candidates to recruit them for Flying, Technical and Ground Duty Officer Branches. It came into existence in the year 2011. Candidates who are interested and eligible can apply for the posts.Read the full notification regarding Afcat and apply online for the post. 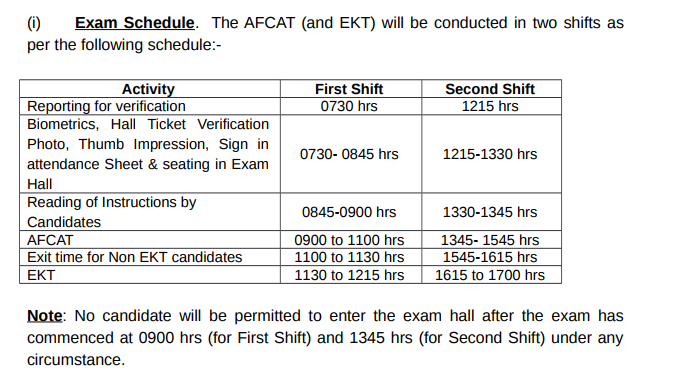 Exam Name: AFCAT 2 2019. 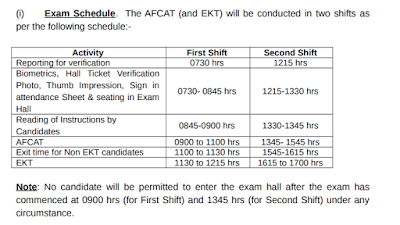 What is EKT exam 2019 ? EKT exam is mandatory for candidates applying for technical branch, it consist of 50 questions with one mark for every correct answer. Ground Duty Branch as on 01-01-2018. Candidates must possess Graduation in any discipline or B.E/ B.Tech with 60% marks for Flying Branch, Four year degree qualification or cleared Sections A and B examination of Associate Membership of Institution of Engineers (India) or Aeronautical Society of India with 60% marks for Technical Branch and Graduation with 60% marks/ P.G degree/ Diploma in any discipline/ C.A/ ICWA with 50% marks for Ground Duty Branches. Candidates will be selected based on the performance in AFCAT & Engineering Knowledge Test (EKT) ( for candidates applied for technical branch only) followed by Intelligence Test, Psychological Test, Group Test, Medical Test and Interview conducted by Air Force Selection Boards (AFSBs). Candidates applying for Flying Branch must appear for Pilot Aptitude Battery Test (PABT). How to Apply: Eligible Male and Female candidates may apply online through the IAF career website www.careerairforce.nic.in from June 2019. How to Apply Online for AFCAT 1 2019 ? Visit the official website of Indian Air force ie www.careerairforce.nic.in. Click on “New Candidate” click link to start the Online Application process. Fill all the five parts of online applications carefully. Note: Keep your User Name and Password safe for future use.